Non-collection specific dining arrangement that capitalizes on the popularity of teak. Great for the mid-sized patio living space as it comfortably seats 4 people. Dining chairs feature woven wicker back panels made from original Lloyd Loom all-weather wicker. Backs won't fray, crack, or burr like real wicker, insuring long lasting use throughout the seasons. Chairs are comfortable on their own, but can be ordered with optional seat pads (additional cost). 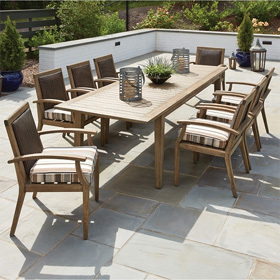 Seats and table top feature classic slat design for a more traditional appeal. Set comes exclusively in a rich brown coloring with antiqued gray accents, and will age naturally to a silvery finish. Custom order chair backs: Choose from Lloyd Flanders Lloyd Loom wicker finishes. Custom order cushion fabrics: outdoor grade Sunbrella and Bella-Dura designer fabrics available for optional seat cushions. Dining Chair 23"W x 24.5"D x 35.5"H 17 lbs. Dining Table 39.5"L x 39.5"W x 29.5"H 64 lbs.